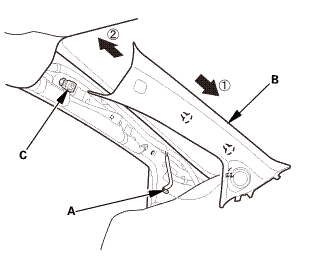 Remove the rearview mirror (A). 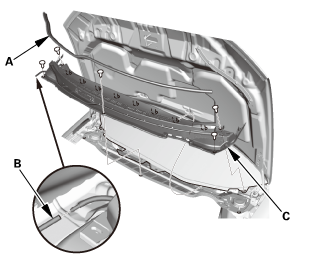 Remove the front of the headliner (A) as needed. 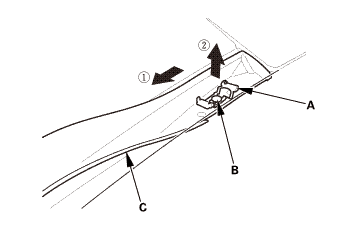 Apply the protective tape (A) to the body. 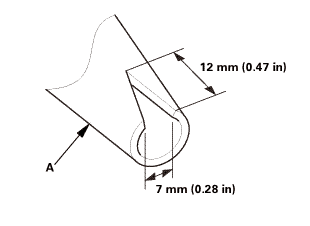 Pry up the roof molding (B) with a trim tool. 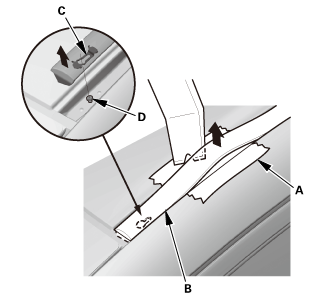 Pull up and slide the roof molding to release the front bracket (C) from the pin (D). 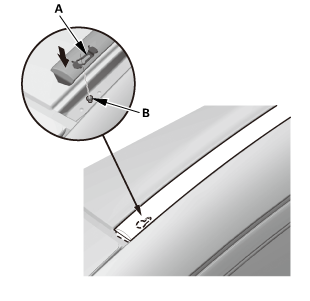 Pull up the front area of the roof moldings (A). 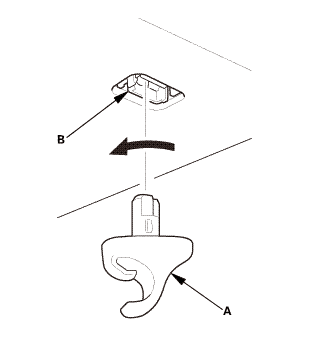 Pull up and release the rear bracket (A) from the pin (B), then remove the roof moldings (C). 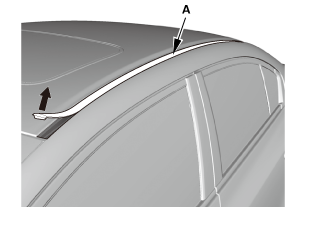 Remove the windshield molding (A) and the windshield side moldings (B). 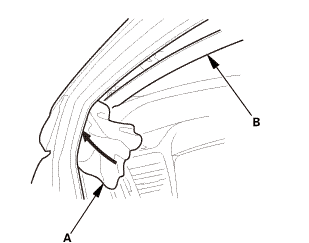 If necessary, cut the windshield moldings with a utility knife. 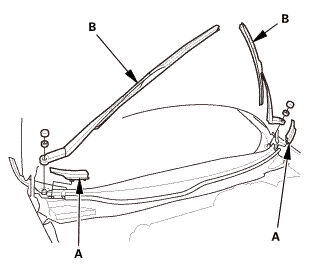 If the original windshield will be reinstalled, make alignment marks across the windshield and body with a grease pencil. 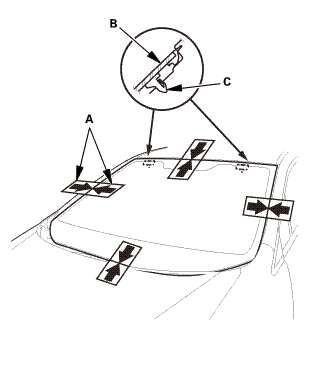 Apply protective tape along the edge of the dashboard and the body. 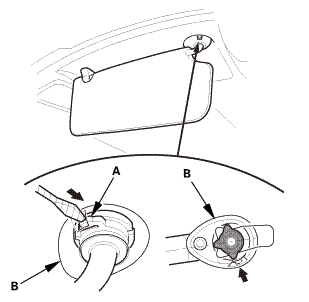 Make a hole with an awl through the rubber dam and the adhesive from inside the vehicle at a corner of the windshield. 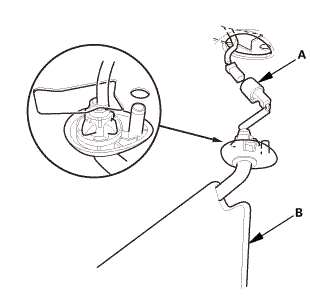 Push a piece of piano wire through the hole, and wrap each end around a piece of wood. 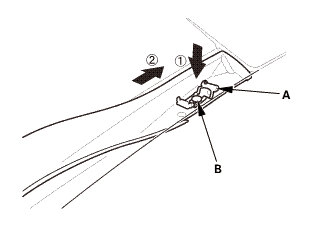 With a helper on the outside, pull the piano wire (A) back and forth in a sawing motion. 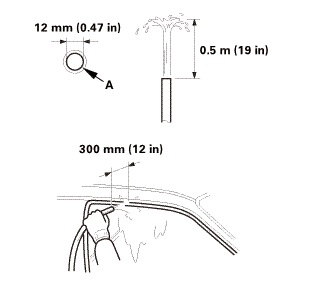 Hold the piano wire as close to the windshield (B) as possible to prevent damage to the body and the dashboard. 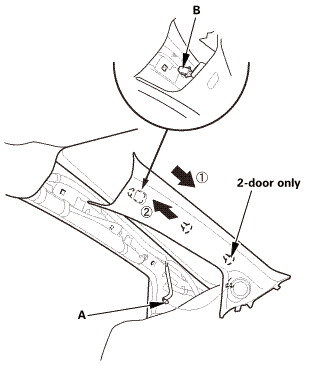 Carefully cut through the rubber dam and adhesive (C) around the entire windshield. 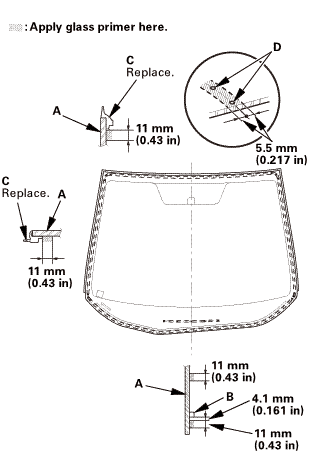 Remove the rubber dam from the body. 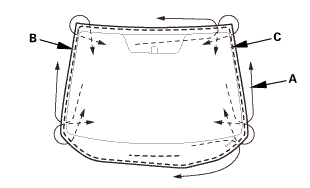 Clean the body bonding surface with a shop towel dampened with isopropyl alcohol. After cleaning, keep oil, grease and water from getting on the clean surface. 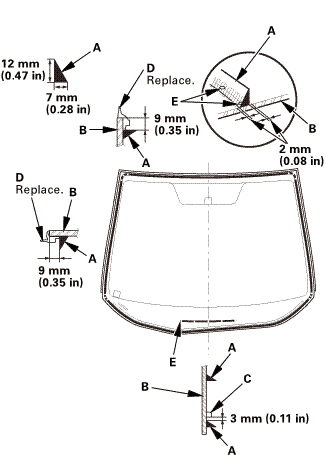 If you are reinstalling the original windshield, scrape off the original adhesive and the rubber dam from the windshield with a putty knife. 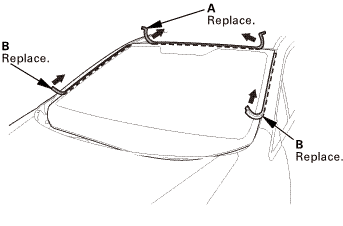 Clean the bonding surfaces on the inside face and the edge of the windshield with isopropyl alcohol. 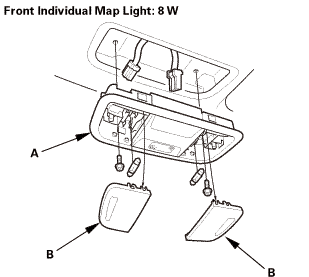 Make sure the bonding surface is kept free of water, oil, and grease. 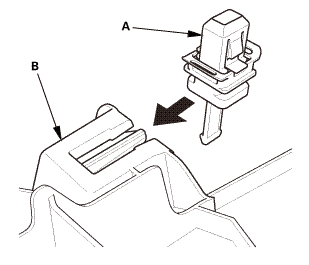 Make sure the rubber dam and the upper clips line up with the alignment marks (F). Be careful not to touch the windshield where the adhesive will be applied. 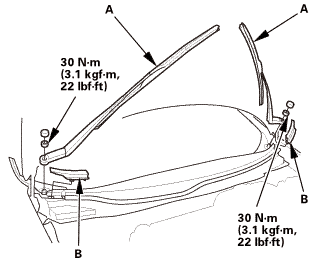 Make sure both clips (C) contact with the edge of the body holes. 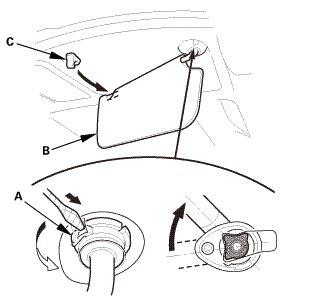 Apply the glass primer to around edge of the windshield using the printed dots (D) on the windshield as a guide. 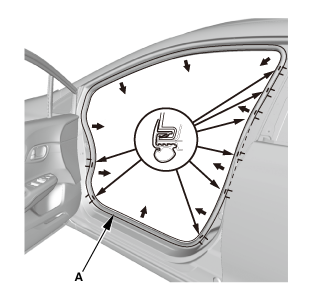 Do not apply body primer to the windshield, and do not mix up the body and glass primer applicators. Never touch the primed surfaces with your hands. 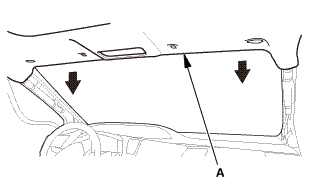 If you do, the adhesive may not bond to the windshield properly, causing a leak after the windshield is installed. 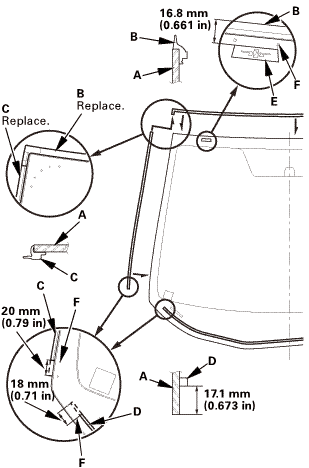 Do not apply the glass primer to any remaining original adhesive on the flange. Cover on the dashboard before applying the body primer. 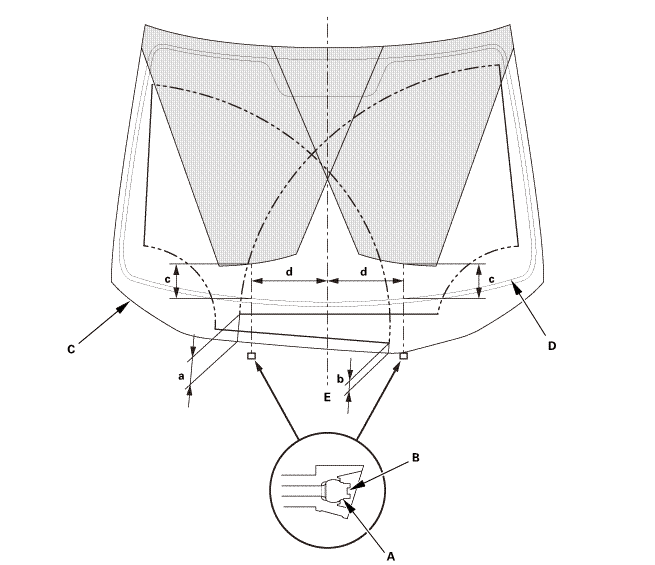 Use the printed dots (E) as a guide when you apply the adhesive to the windshield. 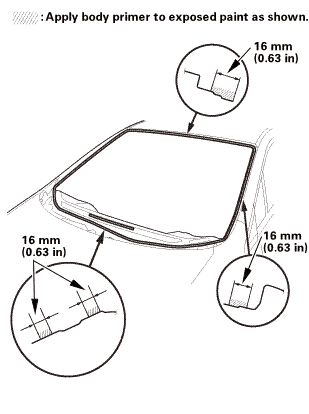 Pull out the glass side adhesive backing away from the lower rubber dam. 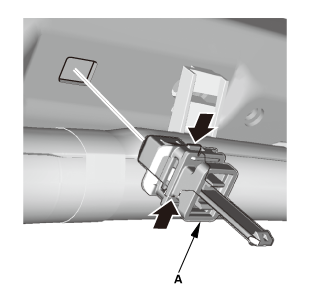 Hold the windshield with suction cups over the opening, align it with the alignment marks made in step 5, and set it down on the adhesive. 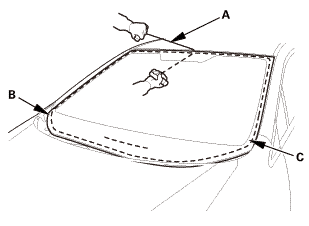 Lightly push on the windshield until its edges are fully seated on the adhesive all the way around. Wait at least an hour for the adhesive to dry, then spray water over the windshield and check for leaks. 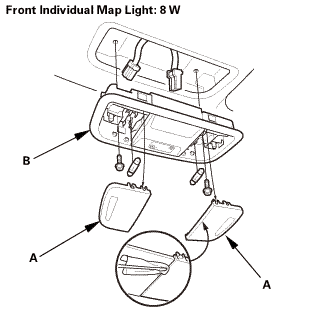 Mark the leaking areas, let the windshield dry, then seal with sealant: Let the vehicle stand for at least 4 hours after windshield installation. If the vehicle has to be used within the first 4 hours, it must be driven slowly. 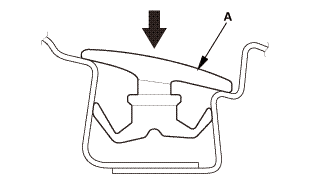 Install the rear bracket (A) to the pin (B). 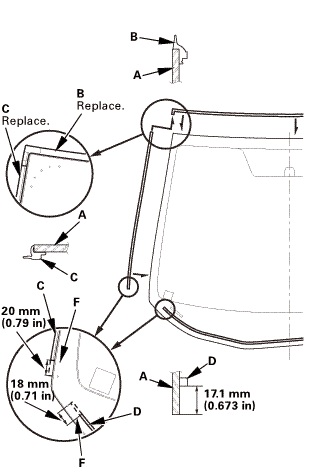 Install the roof molding (A). 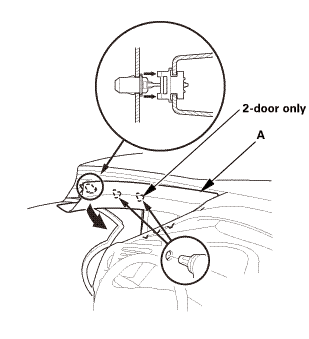 Make sure the roof molding (A) is installed securely. 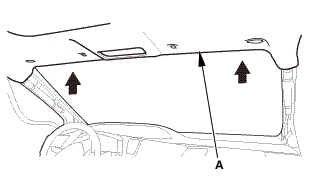 Install the front of the headliner (A). 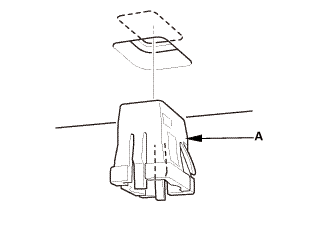 Install the rearview mirror (A). 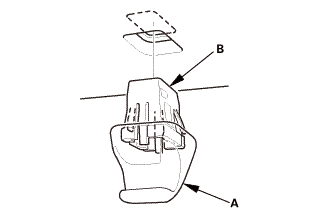 Adjust the washer nozzles by gently gripping, and then moving, the outside of each nozzle (A). 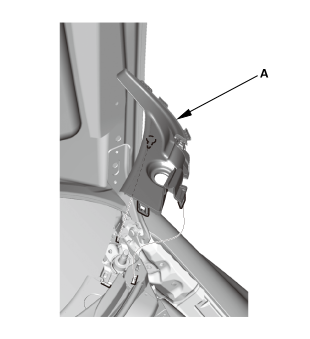 Do not insert tools into the nozzle hole (B), as it may cause the washer fluid to spray incorrectly. 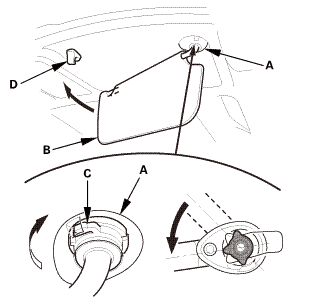 Turn the ignition switch to ON (II), then turn the wiper switch ON, and then back OFF.